LA VERNE, California, February 5, 2018 — After the call to order, pledge of allegiance and roll call formalities were dutifully performed and some minor business (leasing of some water rights and the transfer of funds to the downtown business improvement district), was taken up, the tone in the council chambers on Monday night quickly turned contentious and cantankerous. If you closed your eyes, the room at times sounded more like the disputatious District of Columbia than little La Verne. There was more acrimony in the air than what Patriots fans faced after watching Tom Brady’s Hail Mary fall to the ground at the end of Super Bowl LII. Causing all the consternation and sucking all the air out of the meeting was a freight-train of a fact slamming straight into the City of La Verne: The city owes $50 million, or about $2,903 per citizen in La Verne, and the debtor, CalPERS, wants its money now. The debt is known as an unfunded accrued liability or UAL. It wasn’t as if the pension-bloated express had arrived without warning. In 2000, the state legislature passed a law with then-Gov. Gray Davis’ blessing fattening pensions. The increases weren’t supposed to cost the taxpayer a dime. Economic times were flush, but CalPERS financial projections didn’t pan out. Older employees kept retiring earlier and younger ones continued to build up credit toward their own pensions, blowing a huge hole in CalPERS’ estimates. Pay raises and extended lifespans magnified the impact of the sweetened benefits. Then the Great Recession came along. CalPERS’ stewards of La Verne’s money — and the retirement savings of many other cities — got sloppy and greedy, a lethal combination. Last month, the City held a fiscal sustainability workshop to grapple with how to deal with the massive financial burden. One thing was clear, there would be no more kicking the can down the road. Either deal with the fiscal elephant in the room or be crushed by it and declare bankruptcy in a few years. Department heads came to the workshop with lists of cost-cutting, revenue-generating and debt restructuring measures, and at the end of the exercise, city leaders outlined a plan that they aired on Monday night. At the heart of the plan is to float a $50 million pension obligation bond (POB) to be paid back at an interest rate of 4.5 percent over 30 years at approximately $3 million a year for a total of $90 million. The city will use the money from the bond sale to pay off CalPERS. The alternative is to pay CalPERS directly at a higher interest rate, where payments could total $125 million over the same 30 years. Yet, even if La Verne moves forward with the POB, it will still face a financial shortfall, which means the city will have to tighten its budget belt further while also finding new sources of income. And that’s what sent sparks flying on Monday. No different from a married couple fighting over money, after realizing their credit card debt far exceeds their take-home pay. Does the bickering couple cut back on the cable, the piano lessons and the purchases of Girls Scout cookies or do they cut all three? As part of the City’s multi-pronged, multi-year budget strategy, the city council proposed the imposition of new fees or increases in existing ones, such as the implementation of an annual business fire inspection fee, projected to bring the city $45,000 in additional revenue, or the implementation of a fee for building permits on illegal construction (projected revenues of $10,000). On the table, there’s even a fee for fixing your fix-it ticket. Remember, the staff was encouraged to put all ideas on the table. On the cost-cutting side, street sweeping could be contracted out for savings of $90,000. Suspending general fund contributions to the capital investment fund is projected to save an additional $250,000. Amanda Faught, left, also shared what the La Verne Fire Department meant to her family. But when it was proposed during Year 1 that a firefighter/paramedic be reassigned to a non-ambulance transport position for a projected savings of $50,000 and an engineer/paramedic position be eliminated for a projected $30,000 in savings, tension among public safety personnel and their supporters in the room ratcheted up. 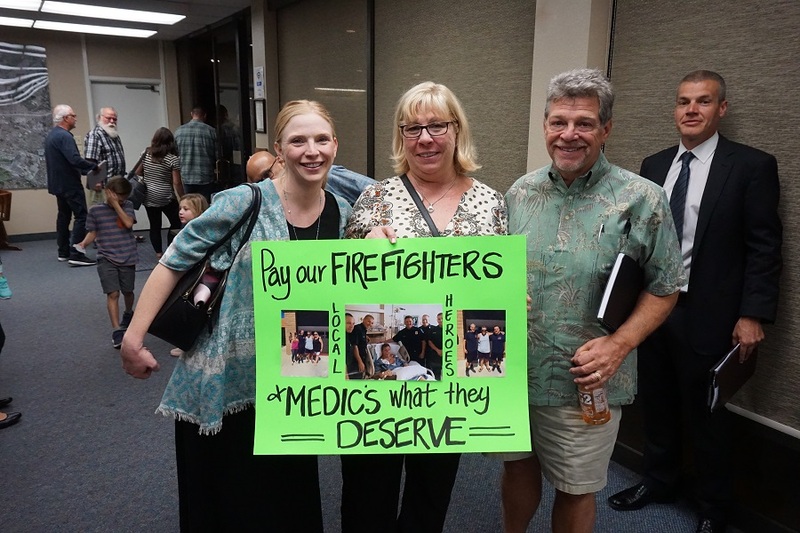 Emotions were further inflamed by the Year 1 proposal to reduce the bonus from 15 percent to 5 percent that many paramedics in the La Verne Fire Department now receive and rely on. Four La Verne paramedics are not eligible for the bonus. Mayor Pro-Tem Tim Hepburn motioned to leave the bonus intact, but his motion lacked a second and fell to the floor like a victim in need of CPR. The lack of support, however, triggered a torrent of testimonials from the pro-Fire crowd. About a dozen citizens marched to the podium arguing that making cuts on the backs of public safety personnel was misguided policy given all that the first-responders do for the city. One woman shared how her baby had fallen from her high chair and landed on her head, lying motionless and breathless on the floor only to be resuscitated by a La Verne paramedic. She chastised the city council for its proposed cuts. “It’s embarrassing that the city council would even have this item on the table,” she said, before yielding the podium to another ardent Fire Department supporter. La Verne resident Fred Faught recounted how on the night of May 24, 2017 he suffered a sudden cardiac arrest attack at his La Verne home while his wife Joanne was brushing her teeth. The arriving paramedic, Andy Glaze, performed more than 200 chest compressions and seven electric shocks to his body. Faught had no heart beat and was blue in the face when Glaze swung into action. Resident Rick Bowen was unhappy about the $50 million liability the City had incurred, asking “How did we get here?” but appeared even more upset that La Verne’s fire-fighting rank and file were being nickeled and dimed when bigger dollars were at stake. “The four who wouldn’t second the motion are the same four who two or three months ago voted to give an $80,000 loan to an existing restaurant to move up the street two blocks,” he charged, drawing robust applause. Instead of the City freezing pay and benefits or downsizing positions, fire department supporters argued that the City should be adding staff and more equipment. While La Verne’s population hasn’t grown much, the volume of calls the fire department answered increased 41% from 2007 to 2017, according to one firefighter addressing the council. Hot spots include the hillsides, the university, the airport, a major freeway, commuter and freight rails. “Our workload has doubled,” the firefighter said. “So you want to put the city at risk for $30,000?” he asked, looking directly at the council. Glaze added that morale among the rank and file had fallen to such a state that La Verne Fire Department members were testing for positions at other departments, in effect, turning La Verne into a stepping stone or revolving door for other departments. The problem is, facing a $50 million CalPERS bill, it’s not known whether La Verne can even afford beer. Councilwoman Carder has long been a proponent of La Verne maintaining its own police and fire but is also committed not to unduly tax the residents of La Verne to maintain that pledge. “You elected us to run the city and keep it financially safe and solvent,” she said. Councilman Charlie Rosales maintained a similar stance, noting that his successors would fault him for giving out “raises” knowing La Verne could not live up to those promises. “Looking at this from a fiscally conservative perspective, it’s horribly painful for us,” he added. Councilman Muir Davis said the La Verne Department had been there for him and his family when his father had passed away and when a younger brother growing up had almost burned the house down carelessly playing with matches and yet again when his mother had recently fallen in the street, yet he felt the Council had put forward a well-crafted package that deserved a chance to work over the next two years, requiring across-the-board sacrifices. “You can do Monday morning quarterbacking and say we should have done this years ago; well we’re doing it now. It’s not easy work. To get a reasonable rate, you have to put together a solid foundation to entice investors. Speaking last, Mayor Kendrick tried to lend some perspective to La Verne’s ordeal, noting that Pasadena faced a $500 million pension-funding deficit and Monrovia, a $110 million deficit. Although La Verne’s pension hole is only $50 million, Kendrick said the city was turning over rocks to find additional savings and revenue enhancers. The calm in the room was short-lived as Glaze addressed the council a second time. He alleged that the council had not turned over enough rocks in finding ways to pay for a first-class fire department. “If he city is indeed facing a financial crisis as just discussed, then you need to consider the possibility of going [contracting with] Los Angeles County and requesting a study,” he said. When comparing La Verne’s Fire Department budget with the Fire budget of another city in the San Gabriel Valley with a similar population that contracts with County Fire, it was noted that the difference in cost was roughly $1 million. Glaze further noted that if La Verne was willing to contract out trash collection, street sweeping, elections and other services, why not police and fire. The question by itself was shocking. 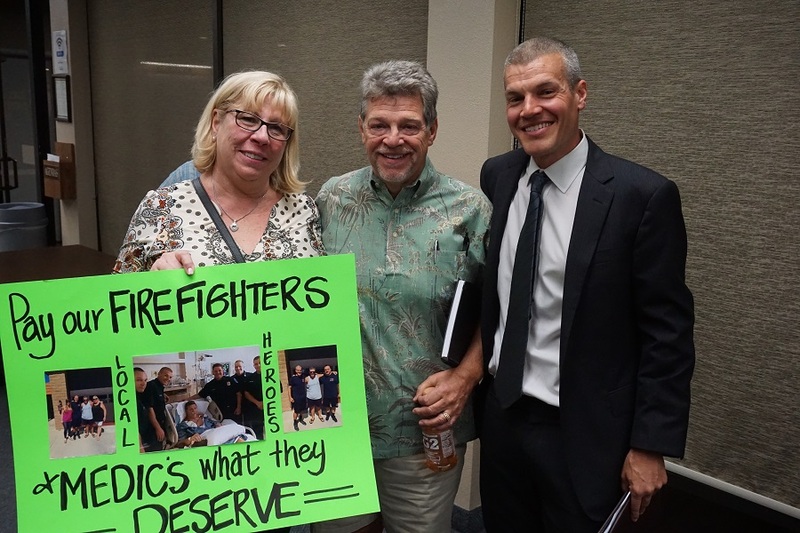 The La Verne Firefighters Association, which also has a lawsuit pending against the City, was making a strong case to go County, where it maintained it would no longer have to respond to emergencies understaffed and under-equipped. “If you can’t afford a fire department, you need to consider going with Los Angeles County,” Glaze concluded. After a moment of awkward silence, Councilwoman Carder asked why Glaze wanted to go County, given how much La Verne residents valued the independence of its fire department. Glaze again cited a lack of resources provided by La Verne and the fact that if he did work for a new employer, it would not affect or diminish the personal service he would provide. A speaker who followed Glaze said the council’s actions were amputating the Fire Department. By the end of the confrontational meeting, many things were said. Some no doubt wished they had said less, other perhaps more. Figures were tossed around like Mardi Gras bangles and beads, and without fact-checkers standing by, it was unclear, where the truth lay. Did only two fire personnel leave the department, as the mayor maintained, or had many left, as a firefighter alleged? What was clear is what a $50 million bill can do the nerves of people who generally like each other under normal circumstances. But these are not normal times for the city of La Verne or its fire department. “If the fire department has a battle with its own chief, and they filed a lawsuit against the city, how can you possibly think that is a good working relationship?” Rick Bowen asked, ducking in one of the final public comments. While his question was greeted with applause, perhaps there should have been a few tears, given the city’s current state of affairs. And for the state of your mortgage financing turn to Tim Manfro, Bonita grad. Click on his ad, and you’ll get the best financing in town! Open some place to buy weed just like Upland which is broke. What’s the big deal if everyone is buying and smoking it and the City needs the money. Thank you for your detailed article on these city issues. I attempted to follow the City of La Verne’s posting of City Council minutes, but apparently they are over 1 month behind with their postings. I appreciate your site. When Grey Davis ok’ed increased pensions La Verne and other entities bought into it. What they allowed were UNFUNDED LIABILITIES! I, also worked for a public agency. Our union also tried to get them to give it to us. Smartly they refused as they knew it was unfunded and the retirement system would not be able to sustain it. I don’t blame the employees for wanting the increase in the retirement benefits but I do blame the people in charge for giving it. 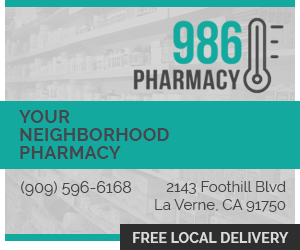 La Verne is just one entity of many that are now caught behind the 8 ball. Has La Verne cut off such high retirements to new employees? I don’t think so. Keeping it the way it is just compounds the problem on down the line. Time to bite the bullet and do what’s right which does not, in my opinion, mean on the backs of those who serve us be it Fire, Police, Water worker, Parks worker or any other existing employee. If all you can afford is beer don’t continue drinking champagne. Peter, another excellent piece of journalism. I don’t know how you manage to get copy out as fast as you do, bravo! The most critical information is not the “Regular Pay” column, rather it is the very last column “Total Pay & Benefits.” As an example in 2016, the first name on the list is Scott Pickwith – Police Chief. Scott received $190,852.43 in regular pay, but he actually received package of $419,153.14 in TOTAL pay and benefits (a difference of $228,300.71 which is more than doubles his regular pay). Keep in mind that the City budget for 2016 was approximately $54 million dollars and then you get some perspective of how large the issue has become. The highest paid 21 employees listed received total pay and benefits of approximately $5 million dollars – just under 10% of the entire budget. Can we afford this structure, or do we need to at least consider alternatives? I know these people and have worked with them for a dozen years, they all work very hard and put in many hours – nobody is debating their contributions to our town. We are simply out of money. Pointing fingers is stupid and pointless. When you find yourself in a hole that is too deep, the first order of business is to stop digging. I suggest an immediate moratorium on all expenditures that are not directly related to public welfare and safety. In short, no publicly funded parties in the park, no street parades, turn off the non-essential lights at night, and pull the tarps over the heated swimming pool when it’s not being used. Collect every penny of outstanding debt owed to the city that can realistically be recovered and then evaluate abrogating the remainder to private industry. It is far past time to hire an INDEPENDENT forensic financial auditor to examine our budget – we are obviously doing something wrong or we wouldn’t be in this mess. Everyone reading this will have some other ideas on saving city funds, let your council-members know what you come up with. Every penny is important, and I mean that literally! Unfortunately, these steps are only going to help a little (which is better than nothing). The real choices are going to be about public safety agencies – fire and police. We have all heard lots of shouting and emotion – response times, victims, heroes. None of that matters, because we don’t have the money for these premier top-tier services. La Verne once could afford these luxury services, but now we cannot. We absolutely MUST evaluate the finances of contracting county fire and law enforcement. I am not yet advocating that we change, but maintaining ignorance by ignoring viable options is irresponsible. It doesn’t really matter how we got into the financial position that we now face. These are the figures, we can’t afford the choices that we have previously made. Now it is time to restructure our spending habits, purchasing what we NEED instead of what we want. Emotion is the absolute doom of financial prosperity.